Twelve Syrian refugees including five children drowned and three were missing after a migrant boat sank off Turkey's Aegean coast. 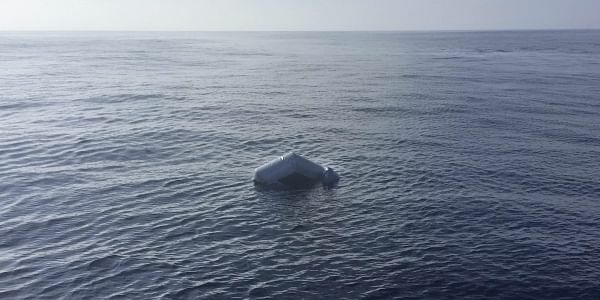 MADRID: Twelve Syrian refugees including five children drowned and three were missing after a migrant boat sank off Turkey's Aegean coast on Friday, local media reported. The bodies of the dead, also including two women, were discovered along the shore in the western province of Aydin, the private Dogan news agency reported. Seven others were picked up alive, the agency said, adding that all of those on board were Syrian refugees. The boat capsized after strong waves and winds, Dogan reported, as it was probably attempting to reach the Greek island of Samos. Two Turkish suspected people-smugglers who had been on the boat were also detained, the agency added. The deaths come less than a week after the first anniversary of an EU-Turkey agreement to halt migrant arrivals in Europe, which has sharply reduced the number of crossings to the bloc from Turkey. But Ankara has raised alarms in Brussels by threatening in recent weeks to scrap the agreement, which came into force after an estimated 1.26 million migrants reached Europe in 2015. Europe and Turkey are locked in a bitter dispute after Turkish ministers were blocked from campaigning on the continent for a "yes" vote in next month's referendum on boosting President Recep Tayyip Erdogan's powers. According to the International Organization for Migration, there were around 363,000 migrant arrivals in Greece in 2016 after the Turkey-EU accord. Under the deal, Turkey undertook to tighten its maritime borders and break up the people-smuggling networks that help migrants to make the risky crossing, in exchange for billions of euros in support for refugees in Turkey. Ankara has also criticised the EU for failing to fulfil its promise to give visa-free travel in the Schengen zone nations to Turks as part of the agreement.